Just Re-powered with NEW Volvo Penta 260HP D4 Engines! 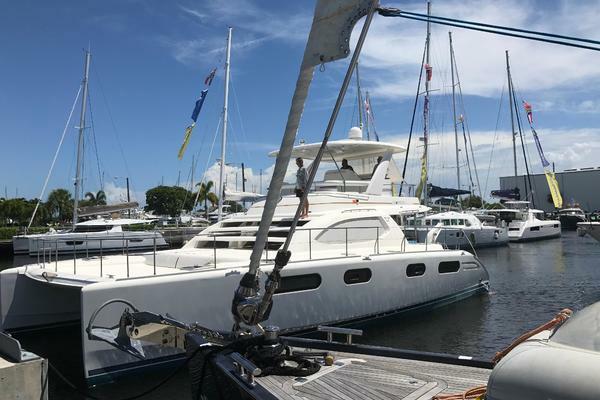 This Power Catamaran is in like new condition with 100 hours on Brand New Engines for under 500k. Guaranteed to Impress! Engines are still full manufactures warranty and are still eligible for an extended warranty through the manufacture. 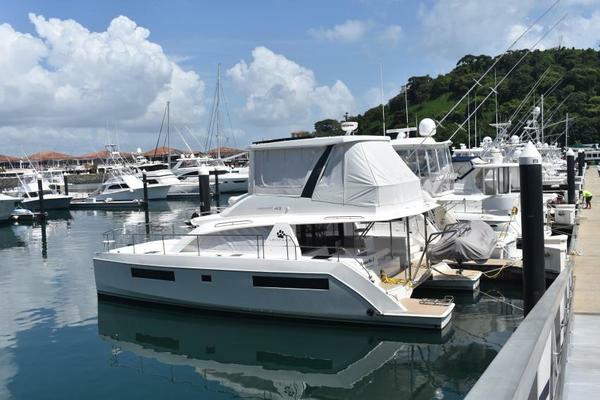 Meticulously Maintained Manta Power Catamaran with, the latest in technology, Fuel Efficient and Reliable Volvo Penta Diesel Engines! Beach Cat has everything a luxury vessel needs to make cruising safe and enjoyable. She is fully Air Conditioned, has a generator, an inverter, solar panels and all new AGM LifeLine House Battery Bank to provide power for days without even needing to start he generator. The Full Galley is equipped with a Propane Oven/Stove and Microwave Oven. Manta really hit the mark with the simplicity of the Dingy Davit system. It is controlled by 2 electric motors that can have the dingy lauched in a matter of seconds with the push of a button. It’s by far the most reliable and easiest dingy davit system ever invented for a catamaran. If you are in the market for a Power Cat, this large shallow draft vessel needs to be at the top of your list! It truly is the perfect coastal cruiser for Florida, The Keys, The Bahamas and The Great Circle Loop. This vessel is large enough to accommodate the whole family and maneuverable enough to easily be captained single handed. From the earliest planning staes these boats were designed to offer a cruising couple the space and comforts of a fine sea-going home with comfortable space for the occasional guest. They were never build for the charter trade. "Beach Cat" sleeps six in three cabins. the Port Hull is the dedicated Owners Quarters with a queen berth, numerous hanging and clothes lockers aft and the forward section dedicated to a huge walk-in shower and separate head and vanity. The Starboard hull offers a Vip Queen berth aft also with ample hanging closet space and clothes drawers and shelves. Forward in the Starboard Hull is double berth. The walk through provides a separate shower, head and addition storage. A Combination washer and dryer and additional storage are located in the forward stateroom. The Spacious Salon provides and open 180+ degree view with comfortable seating for eight, an entertainment center, chart table and gourmets delight Galley.